Compatible with almost all types of mobile phones, can be used with a protective case. Adapt to the phone between 47-92mm, including iPhone (6 Plus, 6S, 6, 5S, 5C, 5, 4S, 4), Samsung Galaxy. The claim can be 360 degree rotated to adjust to the optimal angle. The holding neck can be adjusted by a regulating knob with 180 degree adjustment. Firm and reliable, it protected mobile phone against falling down for different driving status. You can use two USB to charge your devices at the same time, because the USB is independent. One is 1A, another is 2.1A. So you can charge phone, ipad and other device at the same time. 3 colors available for your choice: red, yellow and blue. 1. 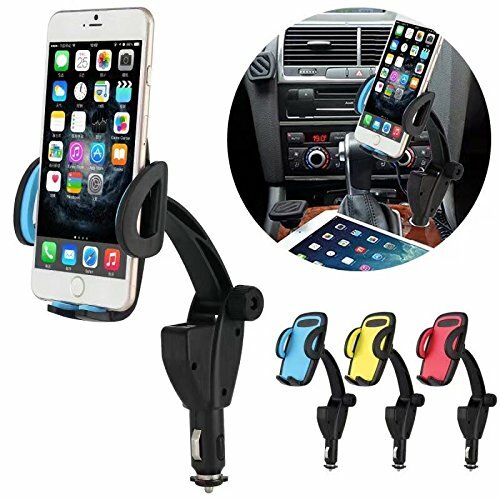 Attach the cradle to the charger holder flexible arm. 2. Insert the cigar lighter into the cigar socket in the car. Bend the flexible arm to the angle you want. 3. Press the side button of the cradle to open the clamp arms, put your device into the holder area. 4. You can use the USB port and the lighter socket too. 5. Charge your device now. If you have any questions about this product by coopsion, contact us by completing and submitting the form below. If you are looking for a specif part number, please include it with your message.